“Modern bird feathers are composed primarily of beta-keratin (?-keratin), a protein also found in skin, claws, and beaks of reptiles and birds. Feathers differ from these other ?-keratin containing tissues, because the feather protein is modified in a way that makes them more flexible,” says Mary Schweitzer, professor of biological sciences at NC State with a joint appointment at the North Carolina Museum of Natural Sciences and co-author of a paper describing the research. The researchers, led by Yanhong Pan, a visiting researcher from the Nanjing Institute, examined fossilized feathers from Anchiornis, using high-resolution electron microscopy, as well as multiple chemical and immunological techniques to determine the molecular composition of the feathers. They did the same to other feathers from the Mesozoic and Cenozoic eras, as well as other ?-keratin tissues not expected to show this deletion, then compared results with modern bird feathers and tissues. 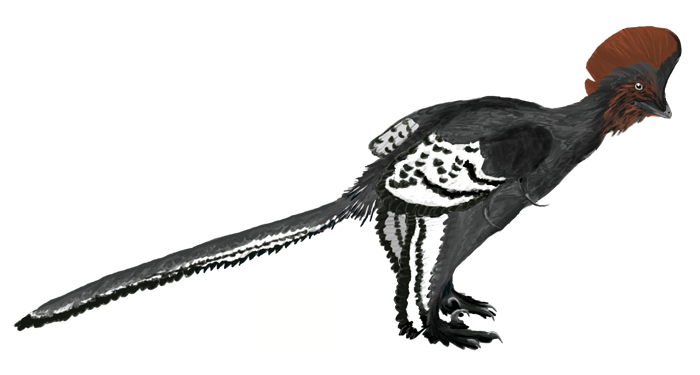 They found that Anchiornis feathers were comprised of both ?-keratins and alpha-keratins (?-keratins), a protein all terrestrial vertebrates have, including mammals. This was surprising because ?-keratin is present in only small amounts in modern feathers. In addition to co-expressing both keratin proteins, the Anchiornis feathers had already undergone the deletion event that sets feathers apart from other tissues. Dinosaur fossils possessing integumentary appendages of various morphologies, interpreted as feathers, have greatly enhanced our understanding of the evolutionary link between birds and dinosaurs, as well as the origins of feathers and avian ?ight. In extant birds, the unique expression and amino acid composition of proteins in mature feathers have been shown to determine their biomechanical properties, such as hardness, resilience, and plasticity. Here, we provide molecular and ultrastructural evidence that the pennaceous feathers of the Jurassic non-avian dinosaur Anchiornis were comprised of both feather ?-keratins and ?keratins. This is signi?cant because mature feathers in extant birds are dominated by ?-keratins, particularly in the barbs and barbules forming the vane. We con?rm herein that feathers were modi?ed at both molecular and morphological levels to obtain the biomechanical properties for ?ight during the dinosaur-bird transition, and we show that the patterns and timing of adaptive change at the molecular level can be directly addressed in exceptionally preserved fossils in deep time.